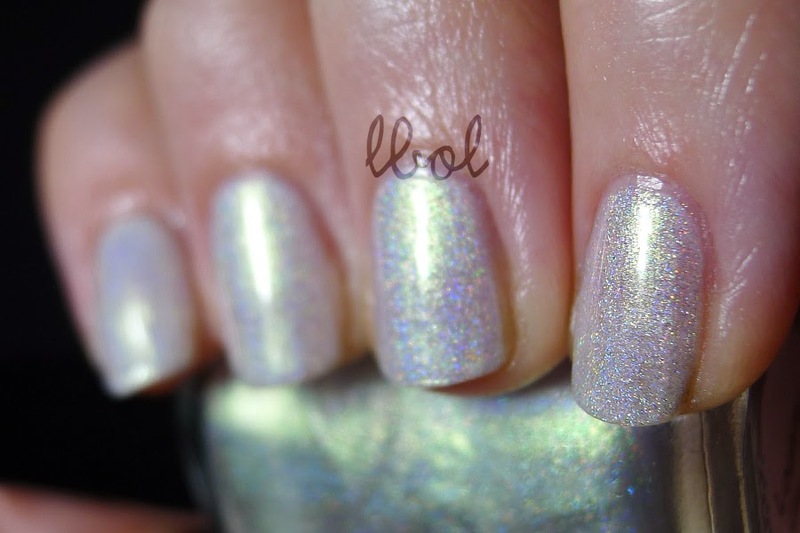 The first Ethereal Lacquer swatch I ever saw was of Looking Glass and I remember just being like, uh, yeah, I need that. It took a couple months, but I found somebody who wanted to swap for it, and then I swatched it. For you! I did that for you! Looking Glass is hard to describe kind of. It's a bit sheer and it's got linear holo and a bright green flash (that, in certain light, looks peachy orange), but I don't know what the heck to call the base. White? Silver? Halp! Because of its sheerness, I've layered it over China Glaze - Dandy Lyin' Around since it isn't a totally opaque, stark white -- I wanted to keep a bit of the, I don't know, ethereal quality of Looking Glass. The formula was easy to work with but I don't think it would ever build to complete opacity on its own. Or maybe I'm just too impatient. Shown below is three layers of Looking Glass over Dandy Lyin' Around with a coat of Essie G2G on top. It's a lovely, soft dreamy color that I desperately wish was less sheer. I'm sure it would make a nice holo topper (which I look forward to experimenting with different bases to go with that green flash).